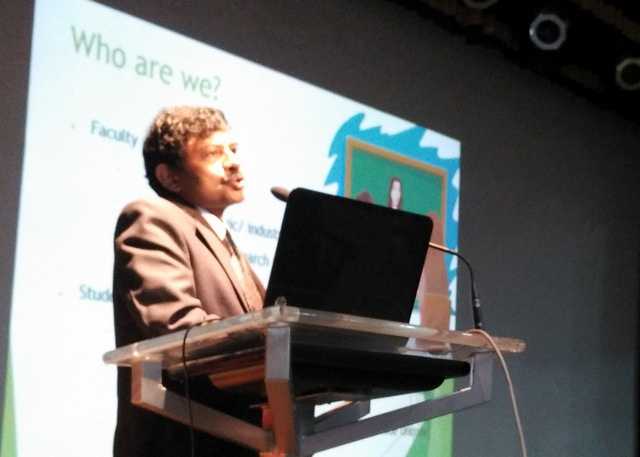 Back to School is an event organised by the students of School of Education, Christ University under the guidance of Dr Prakasha Coordinator of the event. In this event, the students showcased their talents to their class and the faculty. To recognise talent in school students’ teachers should recognise their own talent first is the purpose of this event. It is a fun and eventful programme through which the students get to know each other better. This year, Back to School, was held on 20 June, 2015. Fr. Thomas T.V (Director School of Education), Dr Mallika Krishnaswami (Dean of Humanities and Social Sciences), Dr Jose Cherian (HOD, School of Education), Dr Greta D’Souza, Dr Prakasha G.S and Dr Sumita Rao attended this event along with MA Education I semester students. The programme started with an invocation dance and a welcome speech by the students. 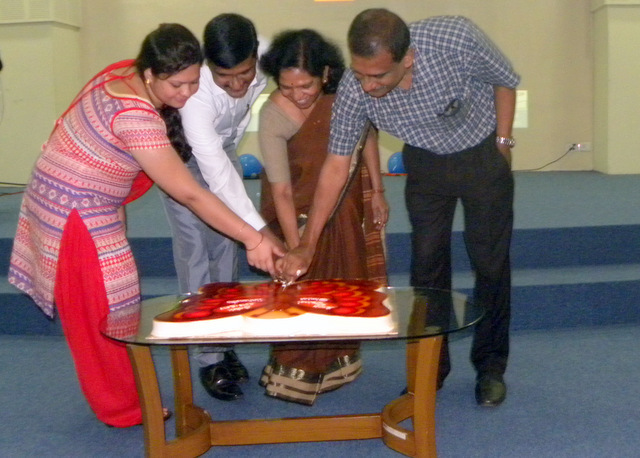 The event was inaugurated by Dr Mallika Kishnaswami, Dr Jose Cherian, and Dr Prakasha by cutting the cake. Dr Mallika Krishnaswami delivered a speech praising the efforts of the B.Ed students and the faculty members. She reminded us that we are the first batch of Christ University to enrol in the two year B.Ed programme and hence we would get intensive training to fulfil our role as teachers. Today, people are very engrossed in their own lives. So, one of the most important things that we can do is spend quality time with children. We should instil in children the right values while they are still at an impressionable age. Dr Mallika Krishnaswami motivated the students to become good teachers through her illuminating speech. The students were then shown an entertaining animation video created by two students from the B.Ed class which captured the whole essence of going back to school. 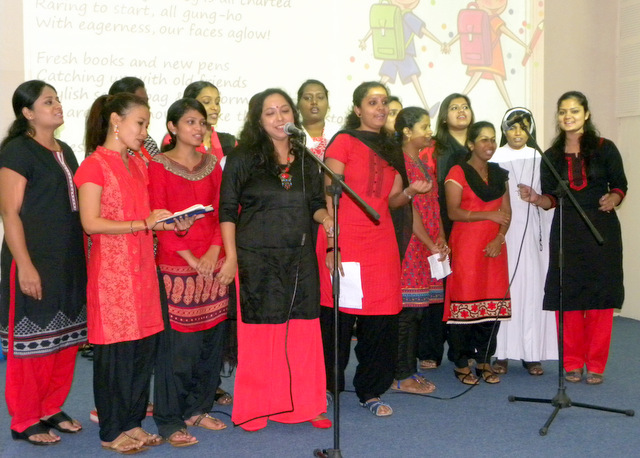 A group of students sang a medley of songs which reminded us of our childhood days. There were also a few solo performances. Some students displayed their dancing skills and enthralled the audience. The Zumba dance group showed how we can remain fit through an enjoyable way. 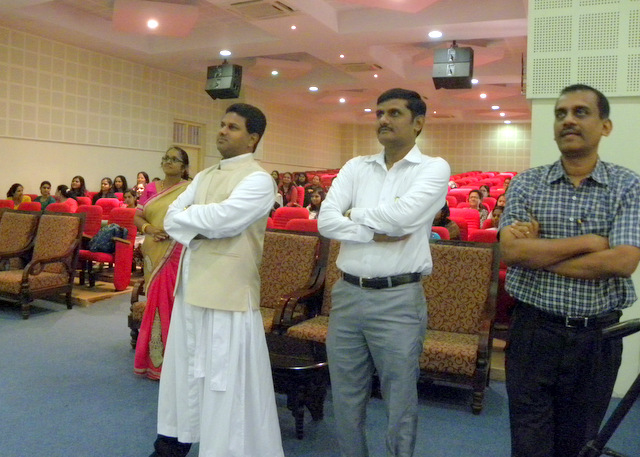 The faculty members and the MA students also participated in the event. They played some fun and competitive games. The students who were interested in crafts displayed their creations. All the students and faculty members were also given some artistic tokens made by a group of B.Ed students. The programme ended with a speech by Dr Jose Cherian. He encouraged us to actively participate in all the events organised by the university. He told us that we would get several opportunities to nurture our talents during the two years of our course. Back to School was a delightful and captivating programme which gave all of us a chance to reconnect with our inner child. The EEP program was kick started in front of 250+ members’ audience at Auditorium, I Block. The function started off with an introductory prayer and inaugural address by Rev Fr Bennny Thomas, Director CUFE, followed by a brief note on EEP delivered by Dr Iven Jose, Associate Dean. Later, the honorable Chief Guest Dr. Manohar Swamy, Director, JED-I, enlightened and inspired the young audience by sharing his engineering expertise and knowledge. The program was culminated with our university anthem. On 2nd June 2014, the head of the Department Prof. K. Balachandran addressed the 3rd semester students who are the new joiners to the Department at the 1st block Auditorium, CUFE at 2pm. Around 160+ students and a few faculty members were present during the address. Prof. K. Balachandran led the students through the history of the Department starting in 2009 till date. He gave a brief overview of the profile of the faculty and the successful alumni of the Department. All the students were inspired by the story of Aditya Damodaran who is pursuing a full scholarship MS programme in SHU after winning a Hacking competition. The session then was about the importance of Computer Science as an engineering discipline and the varied career profiles of B.Tech CS and B.Tech IT graduates. He also led them through the list of core and elective subjects they would be learning through the 8 semesters. A brief glimpse into the efforts made by the Department to improve their academic journey was given – Mandatory Internships, Project-based learning, Research-informed teaching, Certificate programmes etc. The students were given a set of guidelines on the expected behaviour and attitude towards academics and extra/ co-curricular activities. A brief talk about activities conducted through the student association ASCII was given. The session took around 90 minutes. The cash prizes for the winners of MicroSoft Yappon competition held during Magnovite in February was distributed at the end. The inauguration of the new academic year 2015-16, for Christ University, Faculty of Engineering (CUFE), was held on 02/06/2015. The chief dignitary of the day was the Vice Chancellor of Christ University, Dr.Col.Fr. Thomas C. Mathew. The other dignitaries present were Fr. Benny Thomas, Director, CUFE; Fr. Thomas T.V., Director, CUIM; Dr. Iven Jose, Associate Dean, CUFE and Prof. Jeevanad, Coordinator,CUIM. The ceremony commenced with a welcome dance by the university dance team, NRITTA. This was then followed by the ceremonious lighting of the lamp by the dignitaries and coordinators of all departments at CUFE. The prayers were then recited, followed by readings taken from the Bhagvadh Gita, the Quran, the Bible and from the book of St. Chavara. The CUFE choir added melody to the event and enhanced the prayerful ambience. This was then followed by the Vice Chancellor addressing the student body, with an elaborate and effective presentation on creating a nexus between classroom learning and research. The presentation stressed on the importance of doing things and not just learning them. The inaugural ceremony then concluded with the University Anthem. A short while later, Dr Iven Jose, Associate Dean, CUFE, introduced the student team that built an All - Terrain Vehicle (ATV) on campus. The entire team was congratulated for their endeavour and the faculty who supported this team led by Dr. Gurumoorthy Hebbar, Coordinator, Department of Mechanical Engineering; Prof Ram Kumar and Prof Arun Raj, were acknowledged for extending their constant support in designing and fabricating the ATV. Mr Naveen Anthony of 5th semester Mechanical Engineering testified his experience on the entire project. All students were handed out certificates by Fr. Benny Thomas, Director, CUFE. A guest speaker had been invited to address all students on this day. The speaker was Mr Naga Siddarth, CPO, CloudNine Hospitals. Mr Siddarth stressed on the importance of thinking ahead of times and planning for inexistent technologies in the present time itself, as it is these advanced technologies which would be in control of many essential areas in the near future. The main focus of his talk was on being innovative and looking ahead into the future. The guest speaker was then thanked and presented with a momento by Fr. Benny Thomas.